Many people won’t miss something until it is gone. Honda offered its broadly popular Civic model as a hatchback since the first generation Civic was available in the early 1970s. The hatchback proved popular all the way through the 1990s. The seventh generation hatchback (2001-05) was the last to be offered in the US. While Europe, Japan and other markets continued to get the hatchback for the next two generations, it became apparent that America was starting to miss the odd numbered door. 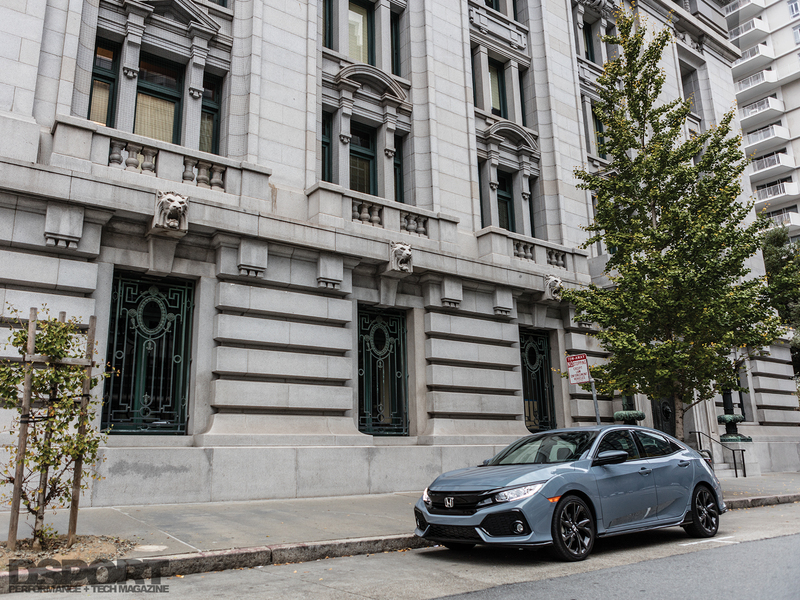 For the 2017 model year, the Hatchback rejoins the Civic family. The Civic Hatchback project was headed up by Design Chief Engineer Hideki Matsumoto. 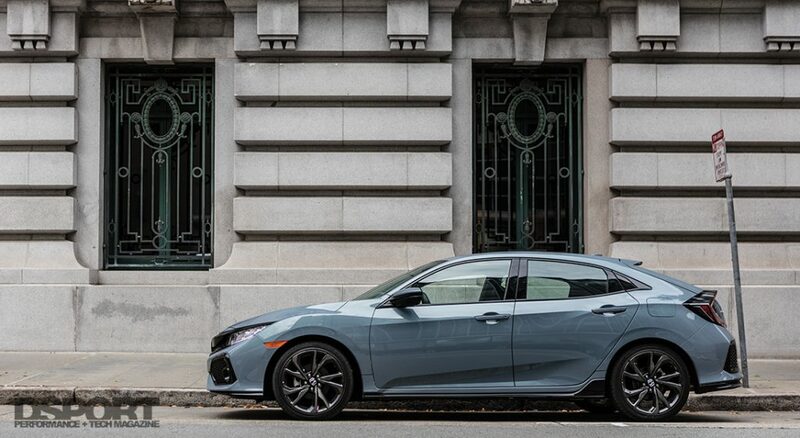 Based on Honda’s all-new global platform, engineers increased the torsional stiffness of the new hatchback by 52-percent while reducing the weight of the chassis by 62 pounds compared to the previous Civic hatchback. 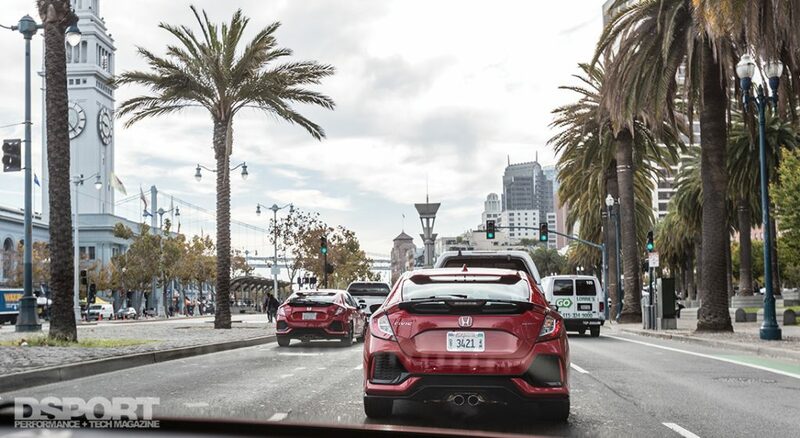 Designed with lightweight, high rigidity, low center of gravity and low inertia in mind, this effort lends itself to the Civic’s handling, feel, fuel efficiency and performance. Although the new Civic Hatchback already hit showrooms in late September of 2016 with three trim package options (LX, EX, EX-L), the new Sport and Sport Touring trims are not due for release until the first quarter of 2017. The Sport trim springboards from the base LX package while the Sport Touring trim carries the EX-L to the next level. 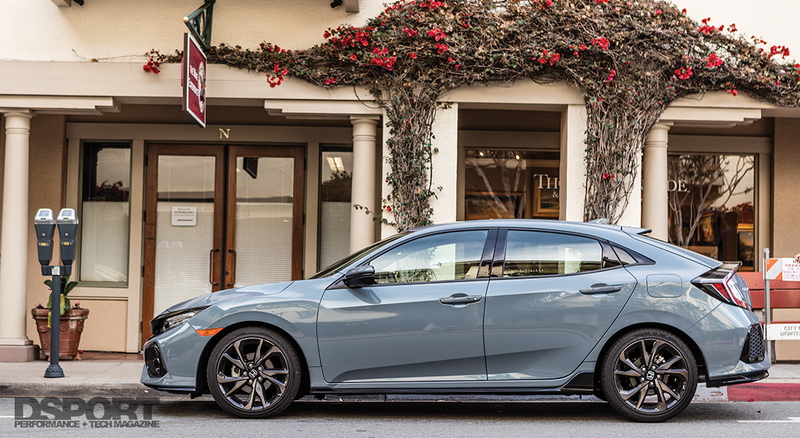 The hatchback is available in six different hues, with the Sport and Sport Touring packages also available in an exclusive Sonic Gray Pearl finish. Unlike the sedan, the hatchback also features a two-part urethane clear coat intended to deliver a thicker clear coat layer that exhibits a European quality finish. We take a closer look at the Sport and Sport Touring models in this First Drive review. Like the Civic coupe and sedan released earlier this year, the two-tier instrument cluster of the previous generation Civic has been abandoned in favor of a traditional, consolidated gauge cluster. 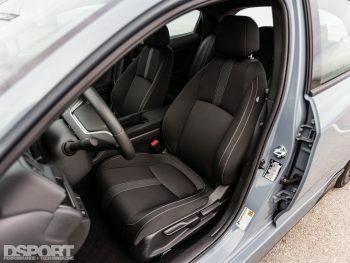 The ergonomics of the rest of the cabin are nothing less than one would expect of a Honda. The control surfaces lay within easy reach and offered the typical refinements that one would expect of the Civic, including automatic climate control, Bluetooth wireless interface and an overall solid fit and finish. A console-mounted electronic parking brake lends to the rich feel of the Civic, in addition to options like remote start and Honda Sensing™. My only real gripe would be the cheap, plastic feel of the steering wheel controls. The previous model had velvety soft touch surfaces on all of the buttons, whereas the new controls are clear plastic and just don’t feel as refined. The Tenth Generation Civic is the first Honda-badged vehicle to feature a turbocharged engine. 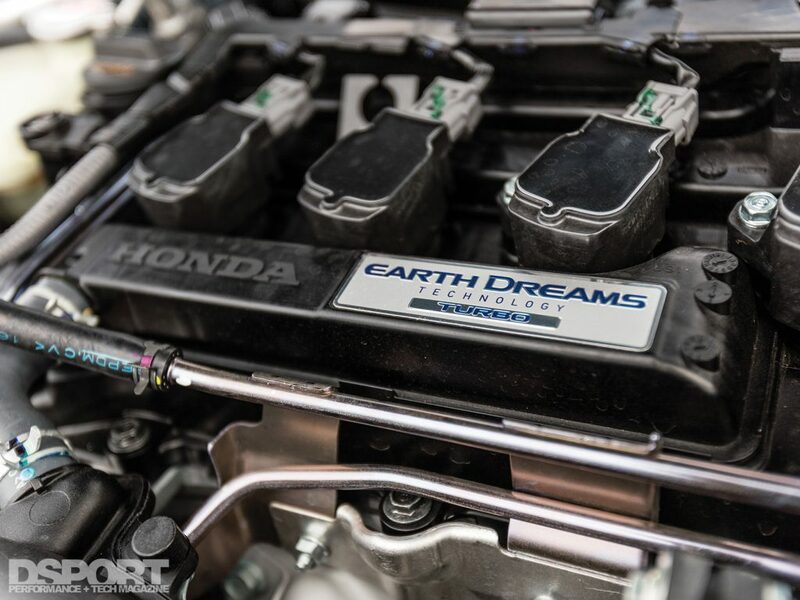 It’s no secret that Honda has always embraced natural aspiration and in doing so, has released innovations like variable valve timing and lift control for both performance and fuel economy applications. But the changing times and the demand for even greater fuel efficiency called for a shift in design philosophy. Development of a small displacement, direct injection, forced induction engine led to the introduction of the turbocharged L15B engine. 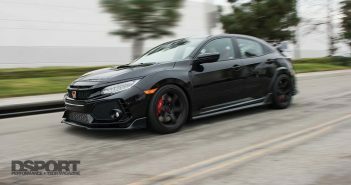 Honda challenged its powertrain development lead, Toshikatsu Takanohashi, to deliver an efficient powerplant that still produced enough power to make the Civic a fun car to drive. In the design of the 1.5-liter L15B engine, he achieved just that. With a bore of 73mm and a stroke of 89.4mm, the L15B features a smaller bore and a longer stroke than the B18C1 VTEC engine that powered the Integra GS-R of the 1990s. Yet, this new engine (with direct injection and forced induction) produces 180 horsepower (as equipped in the 6-speed manual Civic Hatchback Sport) like the GS-R, with an additional 49 lb-ft torque over the B18C, totaling 177 lb-ft.
Another welcome feature of the Civic Hatchback Sport is the return of a traditional manual transmission. 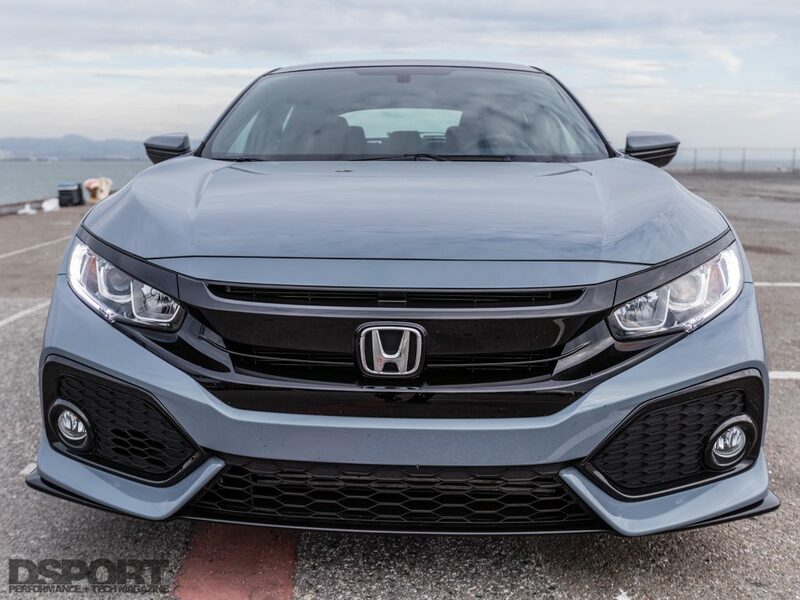 The Civic coupe and sedan come standard with the CVT transmission with exception of the non-turbocharged LX Model and the turbocharged EX-T. 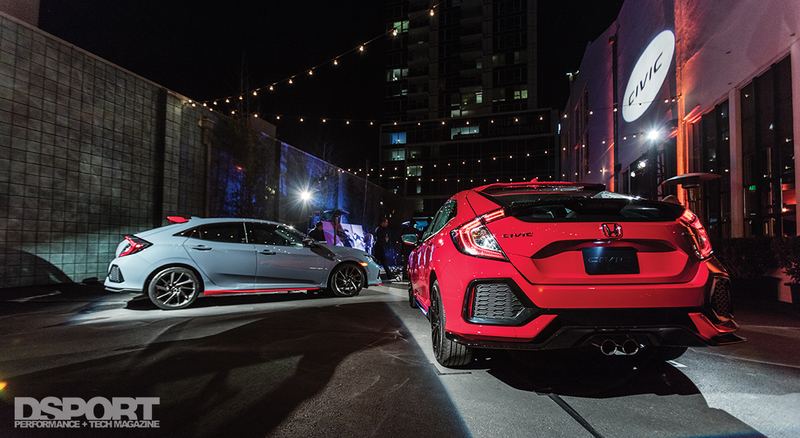 The 2017 Civic Hatchback LX and Sport are offered with a six-speed manual (6MT) transmission as standard. When equipped with the 6MT, the Hatchback Sport gains 6 horsepower and 15 lb-ft torque compared to the CVT-equipped models. 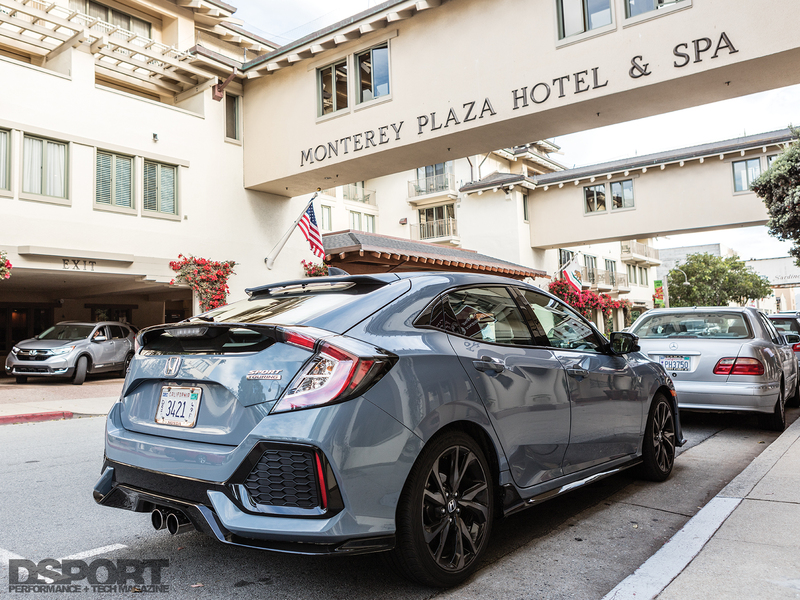 American Honda invited us to test out the new Civic Hatchback in both the Sport and Sport Touring trims in scenic Northern California. Our drive route took us from the heart of downtown San Francisco through Santa Cruz and down to the coastal city of Monterey. Our drive started behind the wheel of the 6MT Civic Hatchback Sport. The view from the driver’s seat offered a clear field of vision. One noteworthy observation was how refined the aerodynamics of the Civic have become. The only perceptible wind noise came from the side mirrors. This made hearing the engine easier, although there was no perceptible exhaust note coming from the Sport’s center exit exhaust. It’s so refreshing that Honda hadn’t lost sight of the enthusiast driver interested in choosing his or her own gears and when to engage/disengage the transmission from the engine. The new L15B engine delivered a very smooth and linear power band offering good response at low-to-mid engine speeds with decent peak output. Although the Civic’s clutch felt a little too dampened for my personal taste, it definitely helps to smooth clutch engagement in the case of bumper-to-bumper driving. For the novice manual transmission driver, it would certainly help to prevent lurchy starts in first gear or jerky transitions between gears. My first experience driving Honda’s early foray with Continuously Variable Transmissions (CVT) was in my sister’s 2003 Civic Hybrid. That car pretty much dampened my expectations of having fun driving a CVT equipped vehicle. 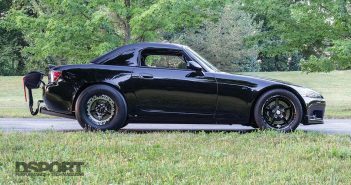 However, more than a decade of experience paired with a turbocharged engine helped to put those reservations to rest. 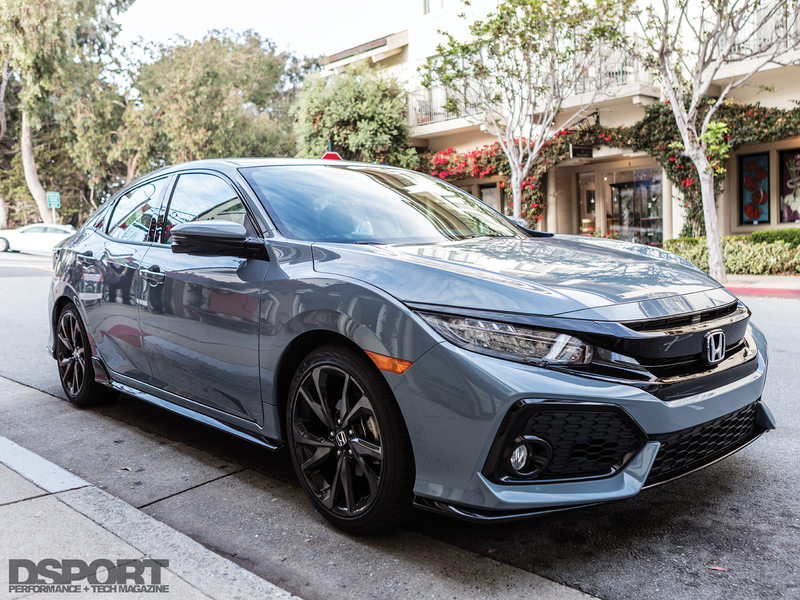 Taking the CVT-equipped Civic Hatchback Sport Touring model up to highway speed at wide open throttle was not as thrilling as it was with the 6MT, but it did not leave us wanting as merging into traffic proved an easy task. Although the CVT does not contain specific gear ratios, manually shifting the Sport Touring model’s paddle shifters permitted an experience similar to a traditional slush box with defined gears. Beyond the L15B engine’s turbocharged horsepower and 42 MPG combined mileage rating, the Civic hatchback Sport’s slightly more aggressive 2.11 lock-to-lock steering ratio combined with its standard MacPherson strut (front)/multi-link (rear) suspension offers a comfortable ride while minimizing body roll through even the most aggressive turns. Although the lateral support from the seats leaves a little to be desired, they’re comfortable and can accommodate a variety of passenger body types. Seating for four within the hatchback with room for luggage in the 25.7 cubic foot cargo area is no problem. A fifth passenger could squeeze in, but it won’t be as comfy, especially on a longer drive. Although the side profile of the Civic hatchback is almost indiscernible compared to the Civic sedan, it’s nice to see the return of the hatchback in a time when European hot hatches are the rage.